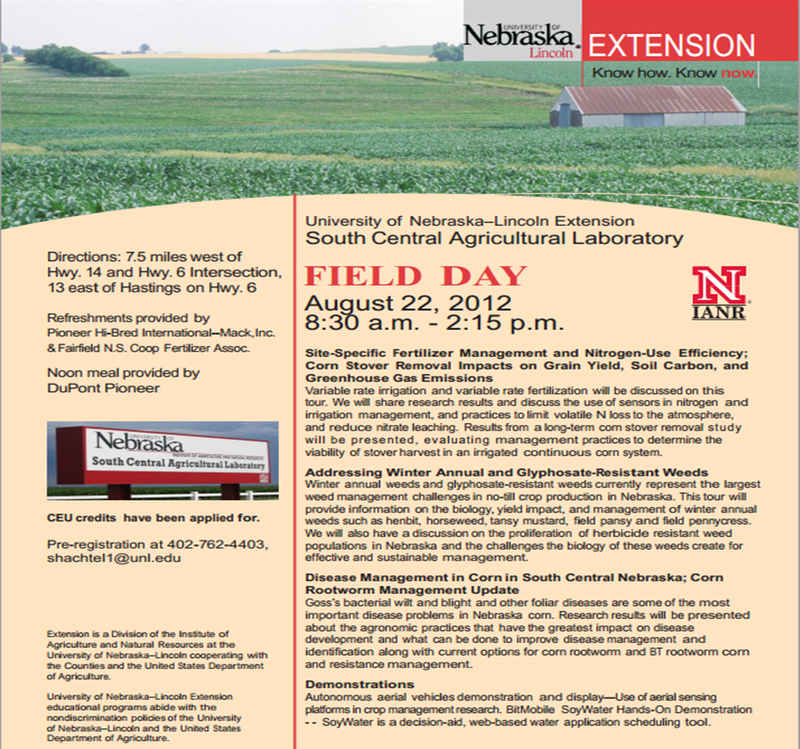 This article originally appeared in http://cropwatch.unl.edu written by Dr. Tamra Jackson-Ziems, UNL Extension Plant Pathologist. Drought and high temperatures promote development of the disease Aspergillus ear rot (pictured right). The fungi that cause this disease (most commonly, Aspergillus flavus) can produce aflatoxin. Aflatoxin is one of many chemicals in a group known as mycotoxins that are produced by fungi (molds). Mycotoxins, such as aflatoxin, can be toxic to animal and human consumers and, at certain concentrations, can lead to dockage or rejection of grain at elevators.The unusually high temperatures and drought this summer are having severe impacts on Nebraska corn. In addition to reductions in test weight and overall yield, secondary problems are developing in some corn fields as a result of these conditions. Corn harvested for grain to this point has been predominantly from fields that sustained substantial drought damage leading to early maturation and plant death. Notable aflatoxin contamination appears to be in a small percentage of southeast Nebraska fields, based on samples submitted to several laboratories in the area. Mycotoxins are common and can be safely consumed at low concentrations. The concentration of aflatoxin that is considered safe for consumption depends on the age and species of the consumer. An abbreviated summary listing the Action Levels identified by the FDA for aflatoxin is listed in Table below. Testing for Aflatoxin: Farmers and crop consultants can scout high risk fields for Aspergillus ear rot as an indicator for aflatoxin, but only lab testing of grain samples can accurately identify the concentrations of aflatoxin in the grain. Accurate lab test results for aflatoxin will depend greatly on the quality of the sample that is collected and the laboratory methods used to test it. The test results are only applicable to the sample that is submitted, so it is very important to collect an adequate sample for the best results. Refer to the publication, Sampling and Analyzing Feed for Fungal (Mold) Toxins (Mycotoxins) for recommendations on how to collect and submit a high quality sample for mycotoxin analysis. Sioux City Inspection and Weighing service Company. Some grain elevators and individuals may be using a black light (ultraviolet light) to detect for fluorescence as a method for rapid screening of grain samples. This practice is NOT recommended when making decisions about aflatoxin contamination in loads of grain. The component that produces fluorescence under black light is called kojic acid. Although kojic acid is produced by the same fungus that produces aflatoxin, its presence is not necessarily an indicator of aflatoxin and might lead to false positive results and unnecessary rejection of grain. Open husks to view a large number of ears. Look for the presence of dusty yellow-green to olive-green spores, especially on the surface of damaged kernels or ear tips (Figure above). Pay special attention to higher risk areas. Harvest and Storage: If fields have documented Aspergillus ear rot and/or risk of aflatoxin contamination, it is recommended that you harvest and keep grain separate from other grain at less risk, such as irrigated fields. Storage of affected grain is not recommended because ear rot diseases and mycotoxins can continue to accumulate during storage. If storage is necessary, cooling and drying grain to less than 15% moisture within 48 hours of harvest will help to slow fungal growth and aflatoxin production. Grain intended to be stored for longer periods of time should be dried to less than 13% moisture. Presently, it is too early in the harvest to know the extent of aflatoxin contamination in this year’s corn crop, but at this time only a small percentage appears to be affected. Resources: For more information, refer to the list of publications below or view this week’s episode of Market Journal. Table 1: FDA action levels for aflatoxin contamination in corn intended for livestock. It’s been a long irrigation season thus far, but we are so thankful for irrigation in this part of the Country during this drought of 2012! Questions continue to roll in regarding last irrigation for corn and soybeans. Corn at 1/2 starch only needs 2.25″ to finish up so it’s important to know what your soil moisture status is. For most irrigated producers, at 1/2 starch, you should be finished irrigating. For soybeans at R5 or beginning seed fill, you still need about 6.5″ to finish out the crop. At R6 when the seeds are filling, that drops to 3.5″. At R7 when you begin to see leaves yellowing, that is beginning maturity and you are finished irrigating. They key is we don’t want to fill the profile going into the fall as we’d like to replenish the profile with fall and spring rains and winter snow. However, with soybeans, it’s also critical not to stop irrigating too soon during seed fill. 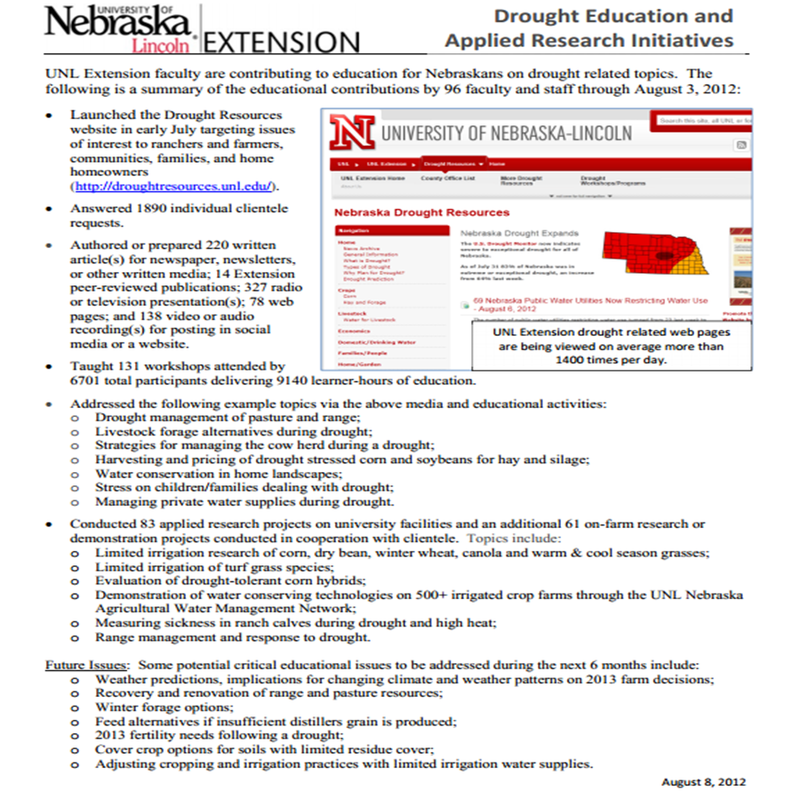 Gary Zoubek, Extension Educator in York County sheds more light in the following video produced by UNL’s Market Journal. 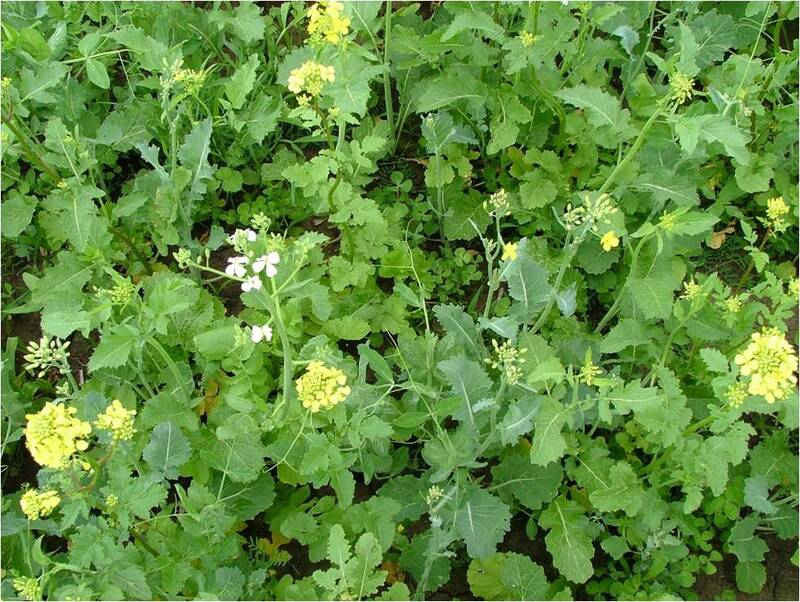 With corn being harvested for silage, corn maturing early, and livestock producers looking for forage options, I’ve received questions about seeding cover crops or forage options. Mike Burgert from the Clay County Natural Resources Conservation Service also wanted me to share the concern of the loss of reside and the increased likelihood of soil erosion. He said if harvesting crops for forage takes place on a USDA program participant’s “highly erodible” acres, this would likely not be an approved conservation system and could cause ineligibility for USDA programs on all of their land in programs. He also said they have cost share for drought related practices (cover crops for forage on cropland, stock water well/pipe/cross fencing/water facility, etc.). Dr. Bruce Anderson shared the following information: Before planting anything, review your herbicide history. Prior use of contact herbicides like glyphosate won’t cause any problems, but some herbicides have a long soil residual effect that could prevent successful establishment of some crops. Double crop choice is likely to be different for rainfed and irrigated conditions. One ton (dry weight) of forage production is likely to use 4-5 inches of water. For rainfed conditions, a crop that will winter kill is preferred in order to accumulate soil water from snow melt and spring rainfall for the next crop. For irrigated conditions, forage production will be more with a crop that survives winter and is spring harvested—although irrigation for the forage and following crop will likely need to be increased compared with no double cropping. 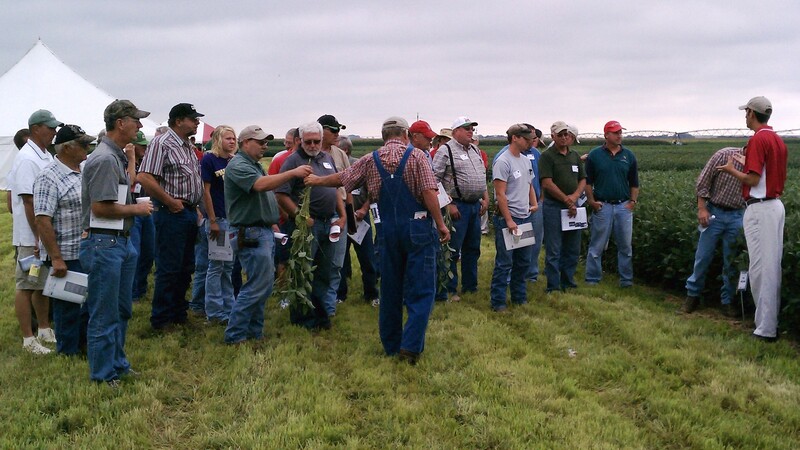 Fall Forage options: Determine when the forage crop is to be harvested and how it will be used. For fall-harvested hay or silage, oats or other spring cereals will outyield all other options. Plant about 100 lb. of seed per acre. Various legumes like hairy vetch, field peas, or winter peas can be added to increase protein concentration a percentage point or two, but they are unlikely to increase dry matter yield; the forage from the cereal alone will meet most cattle protein needs. Also be wary of spending more for the seed than the extra protein might be worth. For grazing this fall and winter, turnips and oats (separately or in a mixture) usually will provide the most feed. Early planting and emergence (irrigation or soil moisture must be available immediately) is essential for successful fall forage. Plantings after Labor Day rarely produce sufficient growth for mechanical harvest in the fall and the amount of fall grazing becomes negligible for plantings made after mid-September. Even earlier planting dates may be needed for sites north of the Platte River. Later plantings should consist of winter cereals. Also, the chances for successful establishment are low unless soil is sufficiently moist to at least an eight-inch depth at time of planting. Spring Forage Options: For spring forage, the winter cereals rye, triticale, and wheat tend to be the best choices. Rye is your best choice for early spring pasture and produces much growth before being terminated for timely planting of a row crop. Some rye varieties also provide enough fall growth for some light grazing if planted early enough. Rye also may be the most reliable crop when planted under stressful conditions. Rye has some drawbacks. It turns stemmy and matures much earlier than triticale or wheat, with a loss in feed value and palatability, although this should not be an issue if harvest ends in time for spring planting of a row crop. Also, it should not be used in fields that will be used to grow grain wheat due to potential contamination that could lead to discounts/dockage when wheat grain is sold. Triticale holds on to its feed value best into late spring. This makes it well suited for hay and silage, or for stretching grazing well into June if grazing begins two or three weeks later than it could begin with rye. Triticale often is more susceptible to winter injury than rye and wheat. Winter wheat will provide very little grazing for fall. During spring, forage quality and acceptance is very high but forage yield is less than rye and triticale. It can be grazed and then allowed to produce grain if grazing ends when plants begin to joint and elongate. Mixtures often can be desirable and can be designed for individual needs. For example, an early planting of 30 lb. of oats plus 75 lb. of winter rye per acre may provide both fall grazing from the oats and spring grazing from the rye.